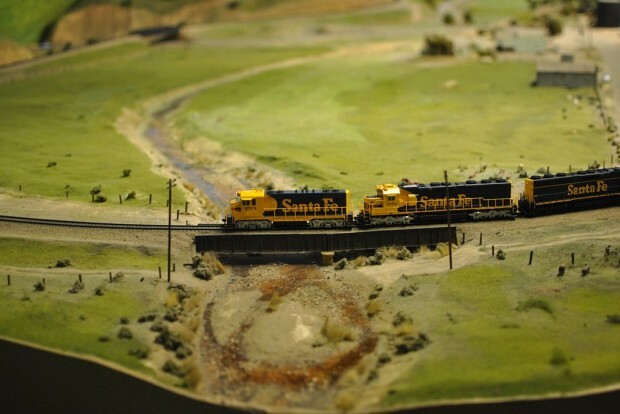 Model railroads are among the most compulsive of hobbies for children and adults alike. Even those uninterested in the mechanics of the rail industry can’t help but be fascinated by the miniature world of the model railroad, with tiny trees, buildings, and complex tracks winding through hills and tunnels. So why not visit the world’s biggest model railroad exhibit? At 27,000 square feet, the San Diego Model Railroad Museum is a scale-model experience not to be missed. As with much of Balboa Park, the history of model railroads here goes back to the International Expositions—in this case, the 1935 Expo, for which pioneer model railroad man Minton Cronkhite built a 40- by 70-foot display sponsored by the major rail companies. Multiple model railroad clubs have been based in the park ever since, finding a permanent location in 1982 at the current museum. The four primary layouts each depict current or historic railroads of the Southwest with unbelievable accuracy. The HO-scale Tehachapi Pass recreates the 1950s Santa Fe-Southern Pacific railroad from Bakersfield to Mojave surrounded by beautiful mountain scenery. The terrain is such that the railway constantly switches back on itself—the Warlong siding’s famous Loop is one of the most fascinating parts to watch, where model trains spiral up and around, the engine actually crossing over the caboose. Also in HO-scale is the San Diego & Arizona Eastern Railroad, stretching from a tiny San Diego Union Station to El Centro. Its difficult terrain has given it the nickname “The Impossible Railroad,” and rightly so—in between is a 10-foot model of Carriso Gorge, trains hurtling over it along the Goat Canyon Trestle, whose real-life counterpart was the world’s largest wooden trestle at the time it was built. The Pacific Desert Lines are at N-scale, almost half the size of your usual model railroad, and are built after plans for tracks that were never built, running east from San Diego. Stretching 33 scale miles, its a sight to behold. The O-scale Cabrillo Southwestern is an imaginary rail line that would run from San Diego to Sacramento. Its larger scale allows for even more detail, including a functional electric trolley line and a working brass fountain in front of the terminal. And if that isn’t enough, there’s the interactive Toy Train Gallery with railcars you can control yourself, an extensive railroad library and a segment of an actual trolley car. The museum can be found at 1649 El Prado, San Diego, CA 92101.